JBoss® Application Administration II (JB348) prepares experienced system administrators to provision and manage Red Hat JBoss Enterprise Application Platform 6 in large-scale production environments. Learn about clustering, performance tuning, and securing enterprise application platform instances, as well as troubleshooting and applying fixes. This course is the follow-on course for Red Hat JBoss Application Administration I (JB248). JBoss Certified Application Administrator (JBCAA) Enterprise Application Platform 6 status is recommended but not required; students should at least be able to accomplish the tasks associated with the Red Hat Certified JBoss Administration (RHCJA) Exam (EX248). Install JBoss Enterprise Application Platform 6 and optional components. Learn about clustering with an emphasis on tuning. Deploy to production and cloud environments. Monitor and manage resources for Enterprise Application Platform. Manage, cluster, and tune a HornetQ messaging system. Configure security settings that include authentication, authorization, networking, and the management interfaces. 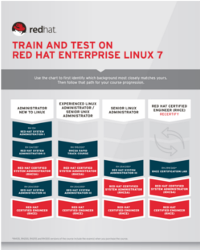 Given the proper installation media, perform Red Hat® JBoss® Enterprise Application Platform 6 installations that are repeatable, upgradeable, and silent. Demonstrate a proficient knowledge of clustering components, their configuration, and application to clustered architectures. Deploy an application in various types of production environments. Script various configuration and management scenarios using command line interface (CLI). Use various tools to monitor and manage JBoss Enterprise Application Platform. Learn how to manage supported messaging systems. Learn the functionality of JBoss Operations Network and its use cases. Also learn how to install a JBoss Operations Network server, an agent, and agent plug-ins. Learn how to use JBoss Operations Network to monitor managed resources, including defining alerts, baselines, and notifications.